The browser simply refuse to browse in it. I can copy the address from Explorer and put it inside CTRL+O dialog, then it will find the folder, however after confirming the selection, main window won't do anything. Also one cannot search for %appdata% folder, even it is regular address in Windows folder tree. Can you browse to the path? If not, on what level does it stop? Can you post an output of dir command for that path (the path where you cannot browse further/deeper from). Any attempt to get to the appdata folder is completly ignored by winscp. AppData folder in the user profile directory does not show at all. 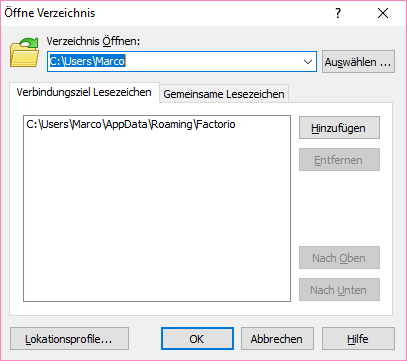 Manually entering the full absolute path to the AppData folder does nothing, just nothing happens, winscp stays in the last folder it was in. I just wanted to let you know, that I also have this problem for years. I never thought of it as a bug. I would gladly offer my help. I've send you an E-Mail with a hint to this topic. This issue might also apply to the Application Data folder error message that I am experiencing in my issue. Is it possible to send me a debug version WinSCP as well? I also have this problem (and just found this page by Google). I'm running Win 10 x64 Pro with all latest updates installed. Would you also send me the debug version please? Great product, but this is a pretty obvious problem plaguing WinSCP. I have v 5.11.2 and see the same problems described above. Martin, have you even attempted to replicate the problem on your end? Of course I did. Works perfectly for me on numerous different systems. And I never got any answer with details from any of the users, who reported the problem previously. So I do not have enough information to solve the problem. Ah, well, honestly, it seemed like you were sending out a generic reply. But shame on the others for not responding anyway. So FYI, this is Windows 7 SP1. Oldie but goodie. Tried on both baremetal and VM in VirtualBox with a fresh Windows install. Version 5.13.3 downloaded and installed via PortableApps. I'm not sure how to update PortableApps with the beta version, but this one is newer. If I try to enter the path Using "Local/Go To/Open Directory", it simply returns to the "home" directory. But at the same dialogue box, I can click on "Browse", and it *will* let me get to AppData in the browse tree. But if I select it and hit OK, nothing really happens. If I go to a different directory, such as a folder under "Dropbox", it works fine. A screenshot is provided. Description: Screenshot of browsing to AppData. This seemingly works, and the path is copied into the previous dialogue, but as soon as "OK" is hit, the (Windows) HOME directory is shown again. Thank you for the beta release. I installed and launched, and verified using Help/About that I had "5.14." Build 8704 2018-08-23. I then tried to see if the problem was the "hidden" attribute, but no cigar. I created a new folder, named "New Folder", marked it hidden, and then tried to navigate with WinSCP. It worked as expected. I have the same problem and I'd like to help also. I'd happily test the beta version. So, can you send me an email, so I can send you back a debug version of WinSCP to track the problem? Please include link back to this topic in your email. Also note in this topic that you have sent the email. Thanks. I am an extremely happy user of your product - except for this bug. I'd be more than happy to help you debug this. i'm seeing the same issue. cannot browse (local->go to->open directory) any directory within %USERPROFILE%\AppData. it's a hidden directory, so it doesn't appear in the tree view, or the directory view. Or that you can see it, but you cannot browse/enter it?